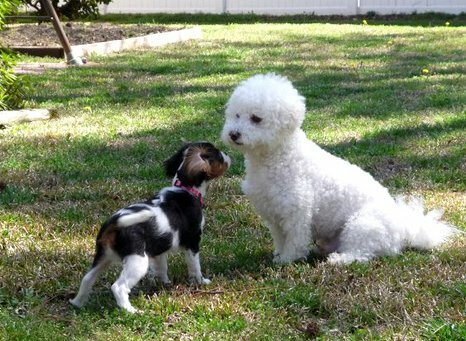 Dog socialization is important if you want your dog to grow up to be a happy and good-natured Bichon Frise dog that people enjoy having around. A Bichon Frise is a naturally friendly and sociable dog, so they are much easier to socialize than many other dog breeds. It is important to socialize your dog as early as possible. If you do so, she will have good manners and will have fewer behavioral problems later, when she is an adult. 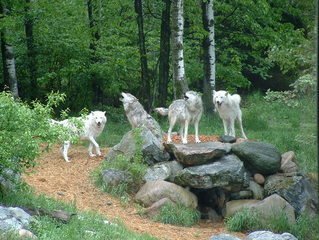 Make puppy socializing fun and creative, so you get the full attention and cooperation of your dog. While Bichons are usually friendly and outgoing, they do need to be socialized, just like other dogs. 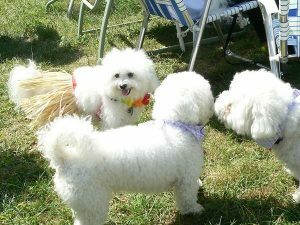 These Bichon Frise dogs are enjoying a little dog socialization. The Bichon Frise is one of the most friendly, joyful, and pleasant dogs. However just like any other dog breed, a Bichon can become a shy dog, especially if he has not had contact with new people and other dogs. Rescue dogs are often shy, especially if your dog has had some difficult experiences with people or other dogs. Take your dog with you to help him meet new people and dogs. Give your dog support in new situations and let him get used to people and dogs at his own pace. Take him for regular dog walks at the park or at the mall, so he’ll get used to seeing different people of all ages, as well as other dogs and animals. You can also take him with you when going camping or fishing, to expose him to nature and the outdoors. Observe your puppy’s reactions, and give him support and encouragement, if he becomes too anxious and fearful. Puppies, like children learn best at a young age. Socializing a dog early takes advantage of a puppy’s best learning age. When you dog is comfortable with new people and animals, your puppy will become happier and healthier, physically and mentally. Of course when your dog learns to behave appropriately, it will make your life easier. 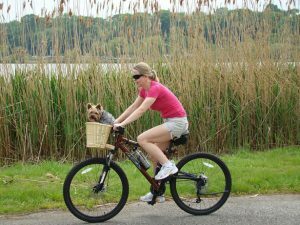 And both you and your dog will be calmer and more relaxed when meeting new people and dogs. Learning the ins and outs of training your Bichon Frise will help you teach your dog to be pleasant, fun and well-mannered when around strangers and new places! Having trouble getting your Bichon Frise to behave? No matter how old your dog is now, professional dog trainer Doggy Dan will show you how to get your dog to be a happy, well mannered pet. You can watch dozens of training videos for just $1–you’ll be amazed at how easy it is to train your puppy!